Harry and Isabelle are a married Navajo couple living at Sheep Springs, New Mexico. 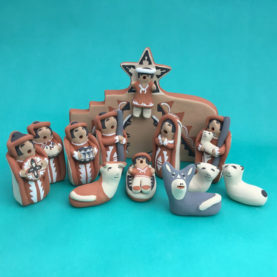 This nativity is carved of wood and brightly painted, a miniature version of a larger nativity by the Benallys. All the details are Navajo. One of the Wise Men is bringing a gift of Blue Bird flour, a brand favored on the reservation. Another wise man brings a Navajo rug. The third wise man brings ears of Indian corn. All these gifts are valued on the Navajo reservation. 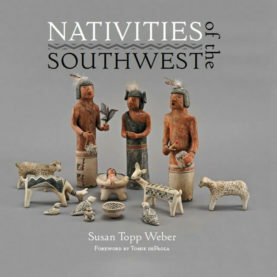 The larger version of this nativity is featured in Susan’s book, Nativities of the World. The tallest figures are about three and a half inches tall inches tall (18 cm. ).